Art is transformative. You hear that all the time, but I’d like to tell you my personal story. At the age of nineteen I visited the Musee D’Orsay in Paris and fell in love. 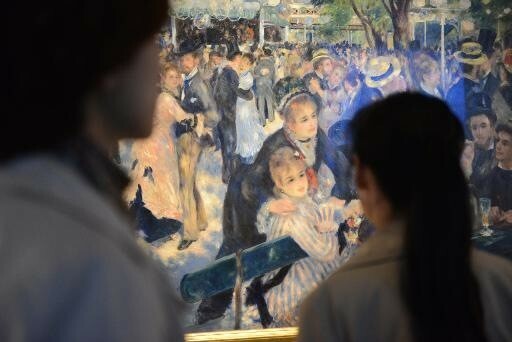 One painting in particular changed my life, Renoir’s Bal du Moulin de la Galette which shows a lively evening at an outdoor dance hall in 1876. My reaction to the scene was so joyful that I put my hand on my heart—and then I looked over at the person standing next to me, and their hand was also on their heart and we both had tears in our eyes. We laughed at each other, but at the same time connected on a level that is so rare these days. I made it my mission in life to foster these kinds of connections between art and viewers. In recent months, I’ve been working with a lot of artists using their work to affect change and heal suffering. At some point this year, I invite you to take a look around and see if there is some way that you can offer your artistic abilities in a healing way. Maybe its volunteering to teach an art class at a retirement home; donating a piece to a charity auction (see tip below); or making work about a particular cause. Doing good feels good and you have a special ability to achieve great things. Currently I’m working with artist Kristina Young who has led a community effort to turn broken into beautiful in Napa, California. In September 2014, just after a 6.0 earthquake shook the region, Young began collecting broken items from Napa neighbors. She has worked tirelessly with hundreds of volunteers to collect, sort and assemble the colorful shards into a 20-foot mosaic mural which will be installed at the entrance of the Rail Arts District (www.radnapa.org), adjacent to Napa Valley Vine Trail. Through her particular medium, Young has found a way to honor what was lost by her community. To help her complete this project, please donate at any level to Napa Quake Mosaic. Another artist I recently consulted with has taken her conviction to the canvas. Janet Berrien changed her life and became a vegan. She stated that when she learned about inhumane farming practices, animal cruelty and endangered species, she felt compelled to paint her passion. She started a new series of paintings called “If Animals Could Tweet” in order to give these creatures a voice. Janet plans to team up with activists and animal sanctuaries to use her work in awareness and fundraising campaigns. In another example, the photographer Norma I. Quintana has used her art to recover from her own misfortune and now reaches out to document the heroic faces of others. After losing her home and studio in a 2017 wildfire, Quintana created Forage From Fire, as a way to honor the memories recovered from the ashes. Currently she is relaunching a portrait series called Forget Me Not inspired by vintage family photos and she plans to travel to Puerto Rico and other areas affected by natural disasters. A percentage of the proceeds from her art sales will benefit Flamboyan Arts Fund. If you are an artist who is stuck in a rut and seeking inspiration, I highly recommend doing something philanthropic with your practice. Share your gift in an inspiring way and the outcome will touch hearts and transform your practice. Extra Tip: Donating work for charities. There is a lot of debate about this in the art world and I won’t go too deeply into it here. But having been on both the giving and asking sides of art auctions, this is how I see things. Supporting a cause is an uplifting opportunity. It can be good for your soul and good exposure for your career. Find a cause that is meaningful to you personally and reach out to see if they conduct fundraising auctions. Here is a great list of Bay Area organizations to start, and also check out this national and international list from The Healing Power of Art and Artists. I like this article on RedDotBlog about what to keep in mind when donating art. I recommend avoiding auctions that don’t give any % back to the artists and always be sure that you promote the auction event through your own channels of promotion to help make it a success. If you still feel nervous about “giving away” your work, hold a special sale in your studio or online and announce that a percentage will be donated to a particular cause. It could be the perfect incentive for collectors and it gives your favorite cause a publicity boost.